Sometimes you feel like a nut seed, sometimes you don’t. Although, the above isn’t accurate, because I almost always feel like eating seeds. 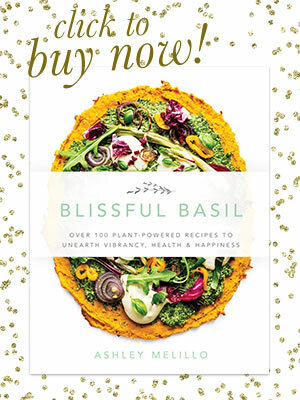 Sunflower, hemp, chia, flax, pumpkin, buckwheat = six of my favorite sidekicks. 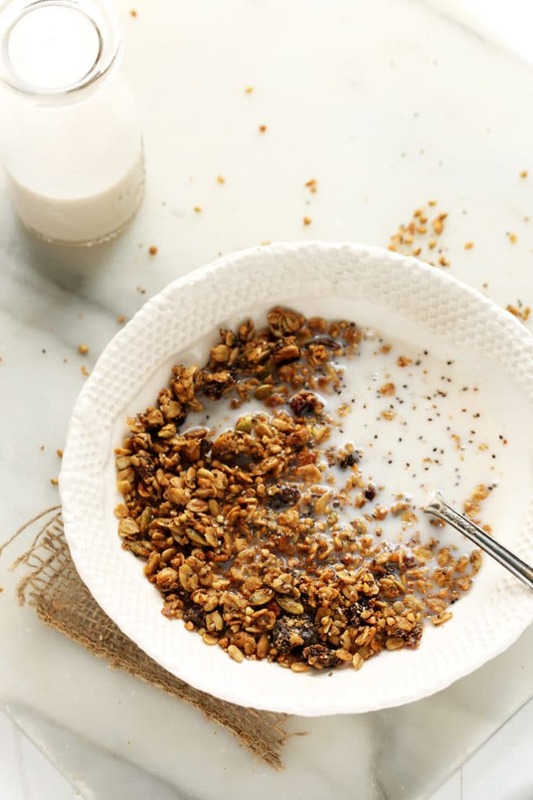 If you’re a fellow seed-lover, then things are about to get real wonderful for the both of us, because four of the aforementioned six seeds are nestled within the crispy confines of this flavorful granola. Move over, nuts, and let your seedy friends bask in their toasted, oven-kissed glory. Having worked in schools over the last six years, I’ve become increasingly grateful that I’m not allergic to nuts. 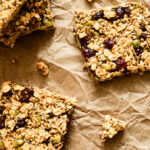 The allergies are often severe and nuts can be tucked away in unexpected foods, making them difficult to avoid unless constantly erring on the side of caution. 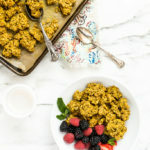 Plant-based desserts, snacks, and other treats often rely on nuts as a primary ingredient, and many of my recipes fall right in line with that nutty trend. 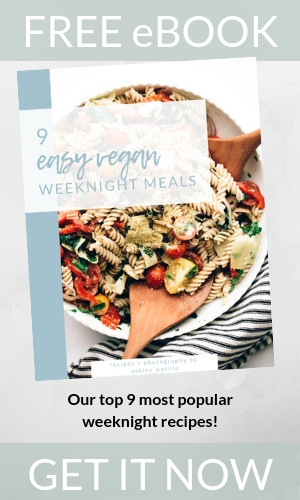 Given that many of you have nut allergies or need to avoid them for a variety of reasons, I’ve been working on a handful of nut-free recipes. Seeds can be just as, if not more, flavorful than nuts, and they’re also incredibly versatile. 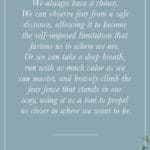 Hence, we have a win-win scenario on our hands. 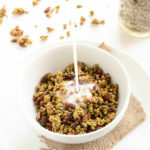 And this granola? It’s a W-I-N with a capital everything. 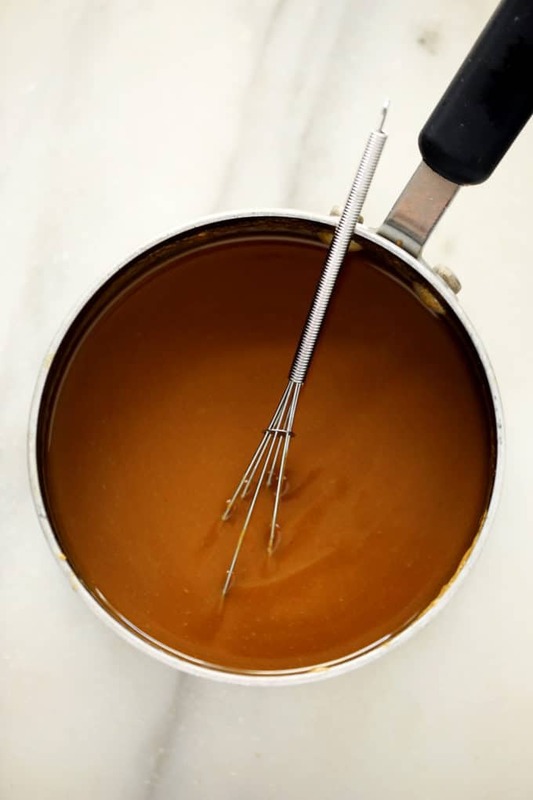 Then, you’ll whisk together sunflower butter, pure maple syrup, coconut oil, vanilla, and a pinch of sea salt over the stove. 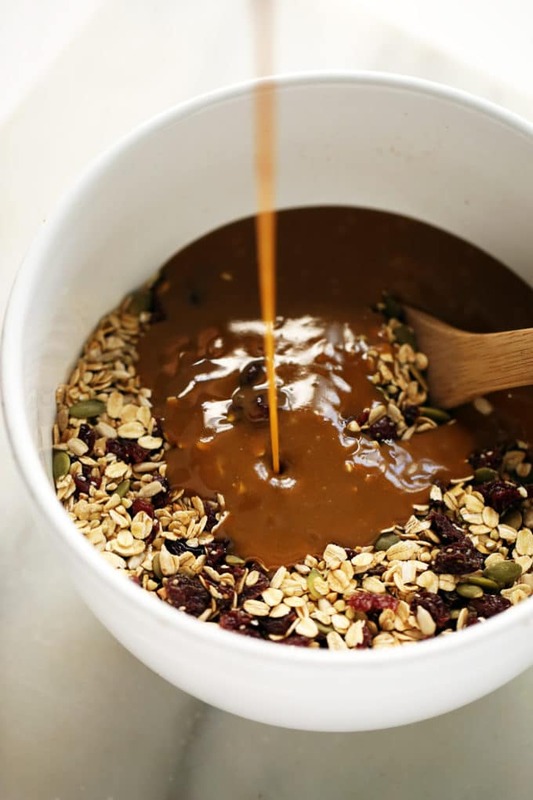 The combination becomes caramel-like and is a nut-free variation of this happy accident from last spring. 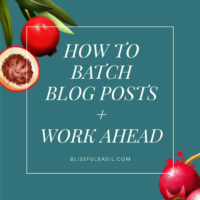 Spread it out over a baking pan that’s been lined with parchment paper, pop it in the oven, and bake for 30 to 35 minutes, flipping halfway through, or until golden and fragrant. The granola crisps up as it cools on the pan, so it’s important to go by look and scent rather than touch when baking. Once it’s cooled, break it up and store it in airtight glass containers or jars to maintain its crispness. Then, snack, savor, and repeat. 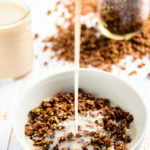 This nut-free, gluten-free, and vegan granola is packed with healthy fats and energizing seeds. Plus, it comes together with minimal prep time. 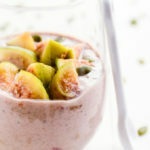 Snack on it all on its own or serve it over coconut yogurt for a parfait-like breakfast treat! 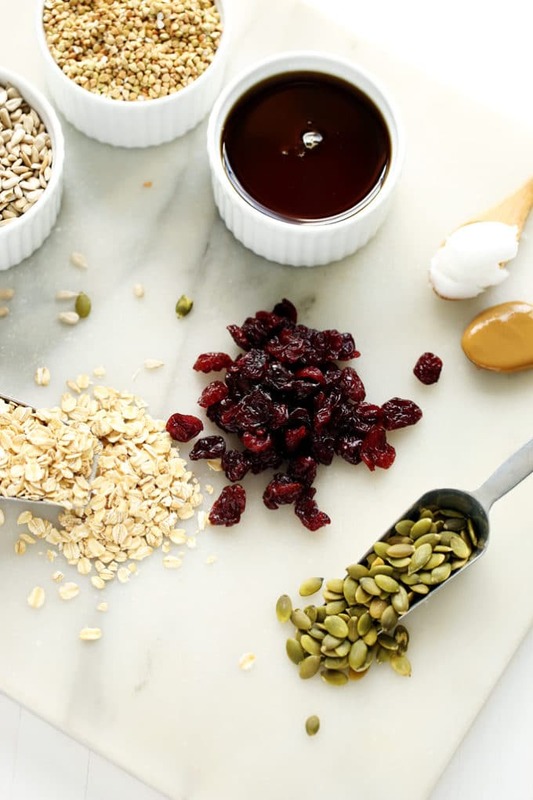 In a large bowl, stir together the oats, buckwheat groats, dried cherries, sunflower seeds, chia seeds, pepitas, cinnamon, and cardamom. 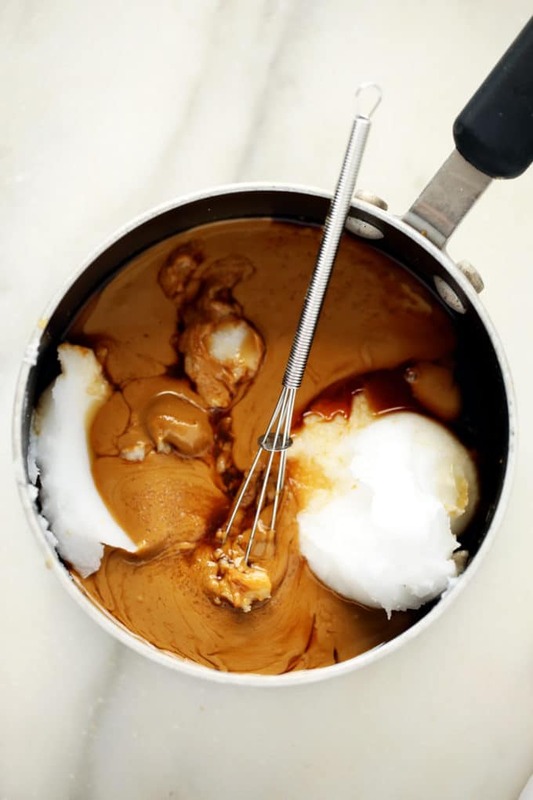 In a medium sauce pan, whisk together the sunflower seed butter, maple syrup, coconut oil, vanilla extract, and sea salt over low heat until melted. This will take about 4 to 5 minutes. Pour the warm mixture over the dry ingredients and gently toss to evenly coat. Line a large jelly roll pan with parchment paper or a silpat and spread the granola mixture evenly across the pan. Bake for 15 minutes. Use a spatula to toss and turn the mixture over. 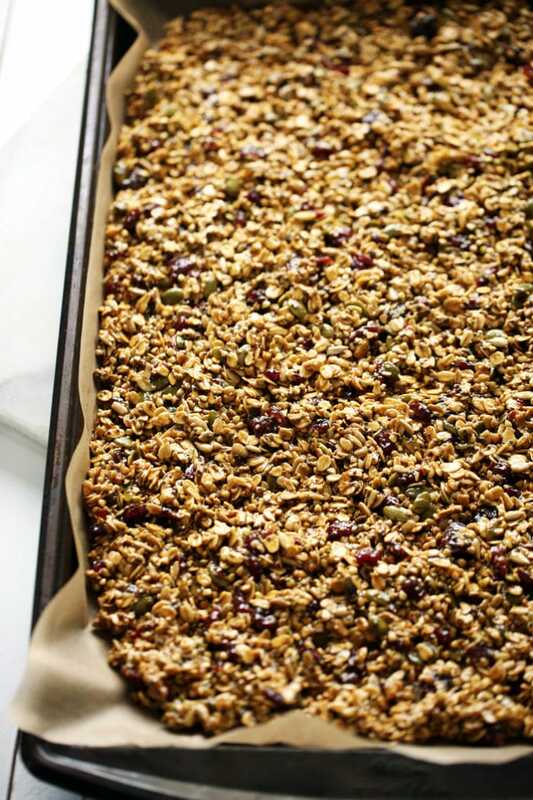 Bake another 15 to 20 minutes or until the granola turns golden. It's best to go by scent, so when your oven starts wafting that warm, toasted smell it should be just about done. 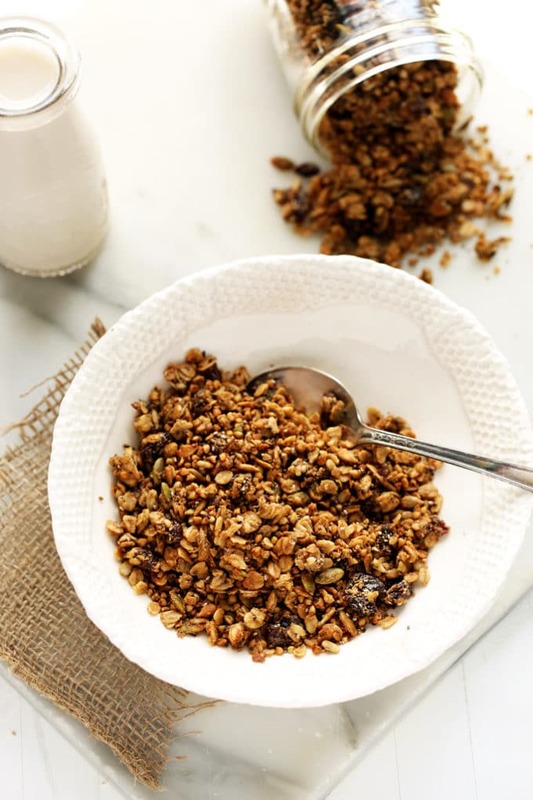 The granola will not become crisp until it has cooled completely, so don't go by texture or you'll end up with burnt granola! Remove the pan from the oven and let the mixture cool completely on pan. 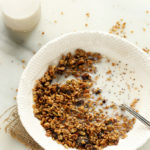 Once the granola is completely cool, break it into pieces. 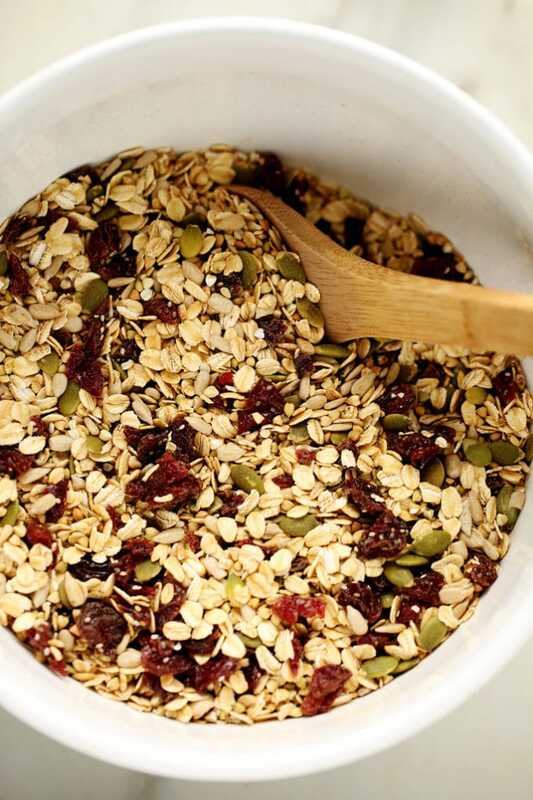 Store the granola in an airtight glass container to maintain its crunchiness. 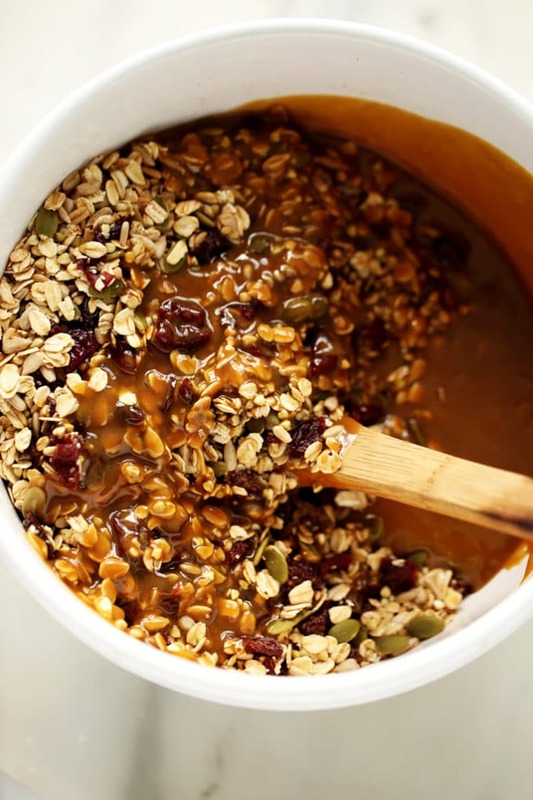 You’ve outdone yourself with this granola! It looks so amazing! 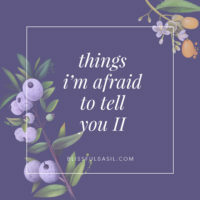 I just made you recipe and it’s so amazing! I love the crunchiness and the earthiness of the seeds and the buckwheat. Perfect balance. I’m so glad you’re enjoying it, Marie!! Thanks for taking the time to share your feedback. 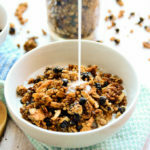 Wow- this granola looks super awesome! But I’m (seriously) scared to make it because I’m scared that I’ll just eat it all in one go! Also- you forgot one more point about seeds- they’re (generally) cheaper than nuts- so perfect for students like me! Haha, I usually have the same fear with granola. It’s always so addictive that it’s easy to put back handful after handful until it’s gone. Also, such a great point about seeds; they really are much more reasonably priced, and that’s always a great thing! Thanks, Ana! Looks great but tell me, how is this gluten free? Oats is the first ingredient. Oats aren’t wheat, so no gluten. A few seconds with a search engine could confirm this.